DIAMOND DALLAS PAGE (AWA, WCW, WWE, TNA) is available for wrestling, appearance & speaking bookings. DDP was a 3 Time WCW World Heavyweight Champion, 2 Time WCW US Champion, 4 Time WCW Tag Team Champion, and WCW TV Champion, plus WWE European and Tag Champion. DDP created the DDPYOGA program used by an increasing number of professional athletes. 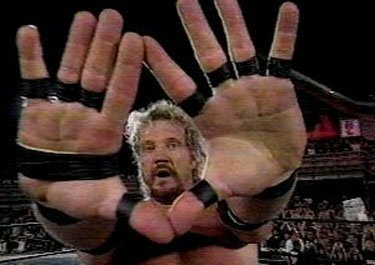 DDPYOGA's creator, pro-wrestling legend Diamond Dallas Page (DDP), bounced back from injuries that would have ended other people's careers due to the resiliency he built up using this system. Now he wants to help others get in shape, lose weight, and build resiliency. Most of all, DDP wants to change lives. What is a good exercise regiment for someone trying to recover from or mitigate the risk of further injuries? What are the health benefits of DDPYOGA over other forms of exercise? How can DDPYOGA help someone lose weight? What sort of diet best accompanies this form of exercise? What is the difference between DDPYOGA and traditional yoga? How can DDPYOGA help athletes perform at higher levels? What is his daily workout like? How can his DDPYOGA workouts benefit people of all fitness levels? How did yoga help him recover from injuries he sustained in the ring? Page is based in Atlanta, GA.